Lemongrass, otherwise known as cymbopogon citratus, is a versatile herb that has been used for the treatment of different kinds of health conditions for centuries. It grows in tropical areas, particularly in Southeast Asia, some parts of India, Africa, and South America. 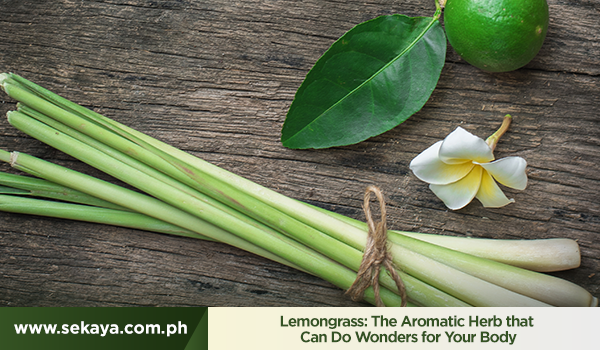 Early records of the therapeutic benefits of lemongrass can be traced back to classical India, where it was believed to be effective in treating a wide variety of afflictions, including digestive problems, and even insomnia. Today, lemongrass is widely used as an ingredient in cooking. The essential oil from lemongrass is also commonly used for aromatherapy, as well as for skin cleansing, and for treating the common cold. Lemongrass has been proven to be a rich source of Vitamins A, C, B1, B2, B3, B5, and B6. It also contains flavonoids and antioxidants that are known to help lower cholesterol by flushing out harmful toxins from the body. A 2011 study1 on the therapeutic effects of lemongrass confirmed the herb’s antibacterial capabilities and its potential for the treatment of infectious diseases. A similar study from 20142 revealed the anti-inflammatory and anti-fungal abilities of lemongrass oil thanks to its limonene content. Finally, in 20153, researchers concluded that lemongrass oil can be effective in treating anxiety after studying its aromatherapeutic effects on humans. Treat your body to a refreshing cocktail of herbs, flowers, and citrus extracts that work together to boost your immunity. Sekaya Citrus Hibiscus Botanic Infusion is a fragrant botanical blend that features the best natural sources of antioxidants and Vitamin C. Aside from lemongrass, it also contains rosehips, hibiscus, lemon peel, and orange peel.